When we talk about ear infections, it means the middle ear infections or the Acute Otitis Media, as called in medical terminology. Usually, children are more prone to this condition than adults. Acute Otitis Media means infection or inflammation of the middle ear. Acute Otitis Media can result from infections with bacteria and virus. 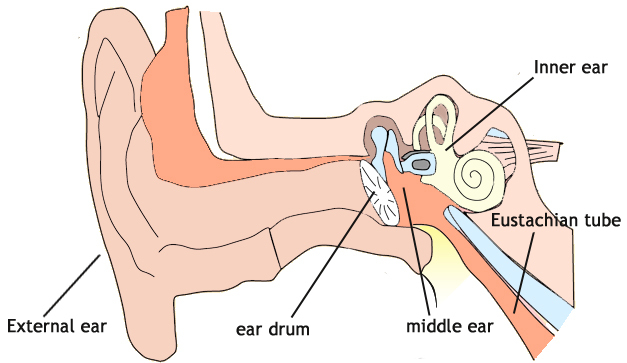 The pressure changes in the middle ear cavity can also lead to this condition. Ex. Some sports like scuba diving and sudden trauma on the ear. Causes: Inflammation and infection of Eustachian tubes is responsible for development of ear infection. Blockage of the Eustachian tube causes the accumulation of fluid in the middle ear. The pressure of the fluid on the ear drum gives rise to acute pain in the ear. The Eustachian tubes are the narrow tubes in the ear which run from middle ear to the upper end of the throat. The Eustachian tubes are responsible for regulating the air pressure in the middle ear and drain the normal secretions of middle ear. Ear infections are usually seen in children and infants. Sometimes, the children are not old enough to describe the discomfort in the ear. Children and infants generally indicate following signs when they are suffering from ear infections. Sometimes, discharge from the ear. In chronic cases it may smell fowl. Adults complain of following symptoms. Presence of cold and cough. Why it is commonly seen in children? In children the Eustachian tube is very narrow, horizontal and short. So, drainage of the fluid becomes little difficult. This causes accumulation of fluid in the middle ear cavity giving rise to blockage of the Eustachian tube and development of ear infections. Although, infection of ear is very common in children, not all children suffer frequently from ear infections. Following factors determine the high risk children who can develop ear infection. Age of the child: Children between 6 months to 2 years are more prone to ear infections. Bottle fed babies: When the babies are lying down with bottle of milk in the mouth, there is a chance of blocking the tube and getting the ear infection. There is also a chance of regurgitation and developing pneumonia. Breast feeding is safer because while breast feeding the head of the baby is at upper level than the rest of his body and the breast milk contains antibodies that may offer protection against many infections. Living in a congested place: When many children are kept in a small room as in a day care, the spread of infection is very fast due to close contact. Air pollution: Atmospheric air quality plays a significant role in developing cold and ear infections in the children. Exposure to cigarette smoke and various gases causes the frequent episodes of ear infections in children. The child may develop decreased hearing when he is suffering from the acute ear infection. If he is not treated carefully rupture of ear drum takes place. Mastoiditis (infection of ear bone) and Meningitis (infection of brain and spinal cord) may occur in extremely chronic cases. Conventionally, the infection of the middle ear is treated very well by using antibiotics and cold remedies when the child has cold. Those children who suffer from recurrent infections in ear, homeopathy is highly suggested. Children with low or weak immunity can frequently get cold, cough and other kind of infections. Homeopathic medicines correct the deranged immunity in children and make them strong enough to fight the infections. Thereby reduce the chances of frequent upper respiratory tract infections and ear infections in children.